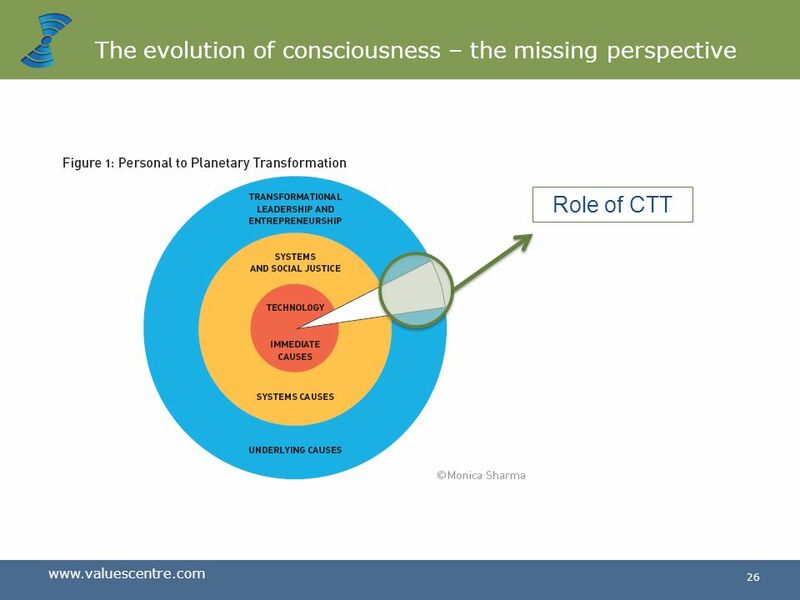 2 When did consciousness begin? UNDERLYING THESIS OF MY RESEARCH Fundamentally, everything in our physical world is primarily an energy field with a quantum existence. 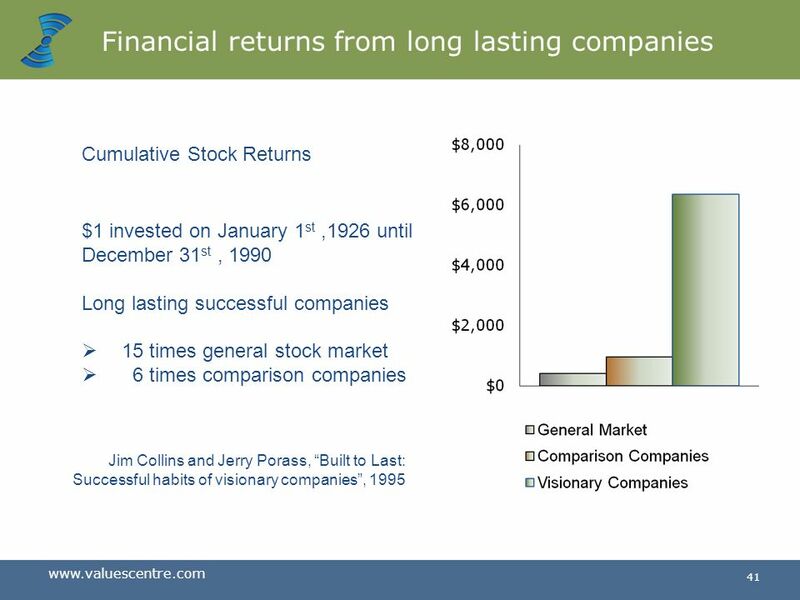 Nothing is fixed, everything exists as a field of opportunity. 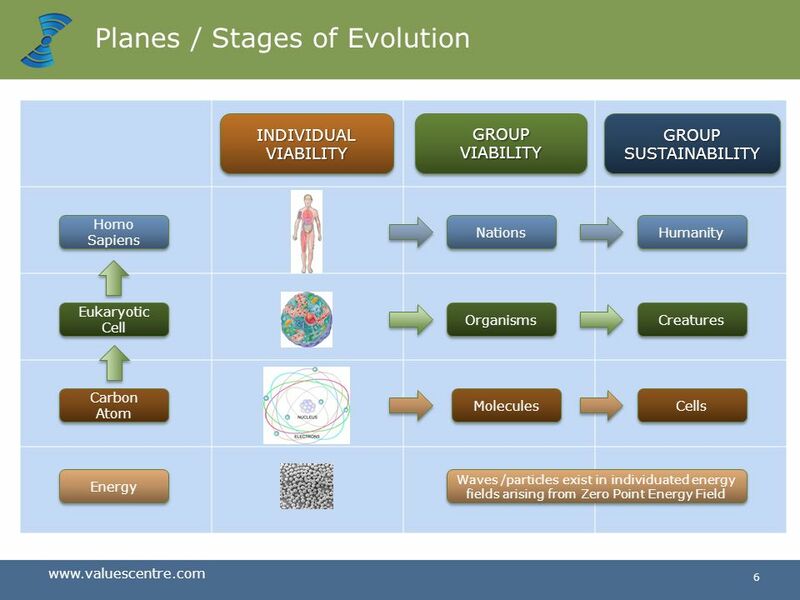 All energy fields arise from the zero-point energy field. 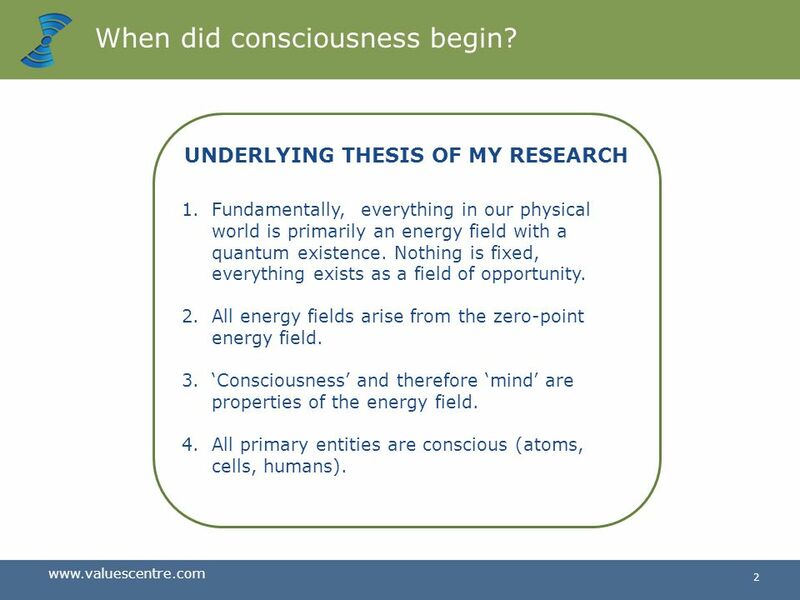 ‘Consciousness’ and therefore ‘mind’ are properties of the energy field. 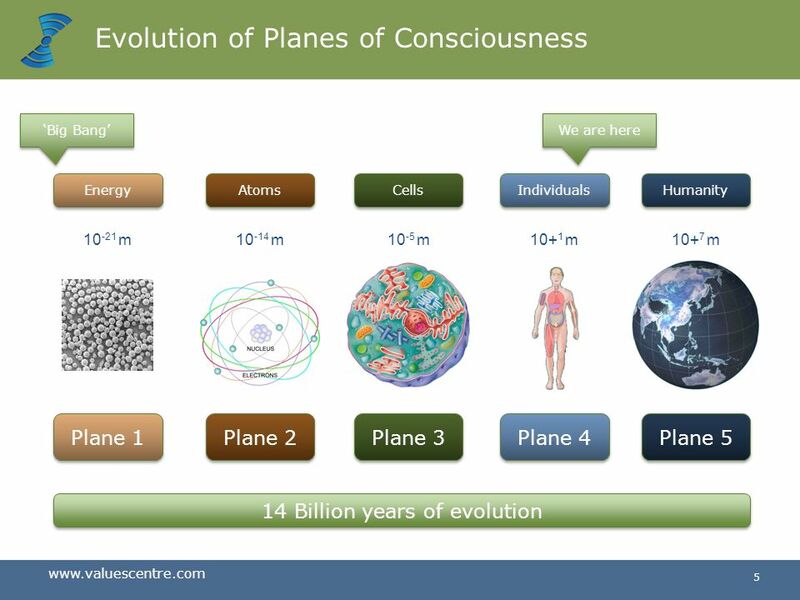 All primary entities are conscious (atoms, cells, humans). Corrected quote for accuracy. 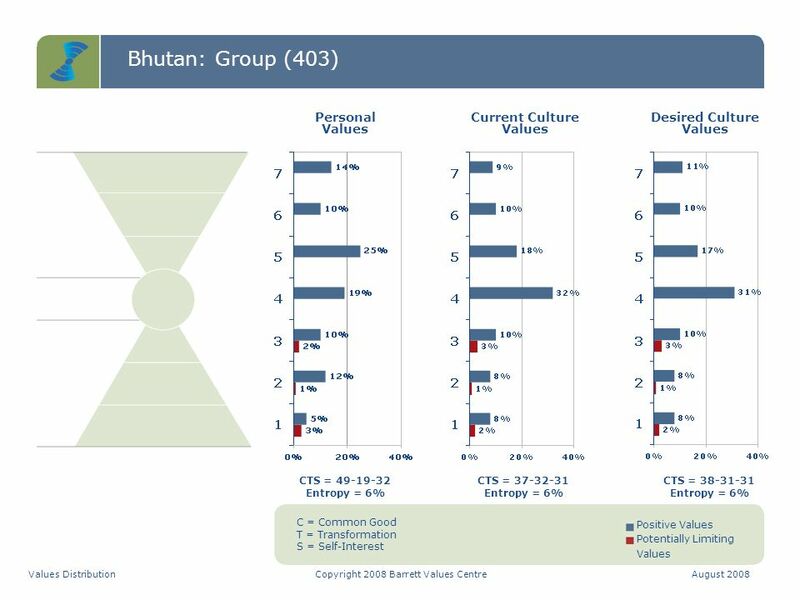 UNDERLYING THESIS OF MY RESEARCH 5. 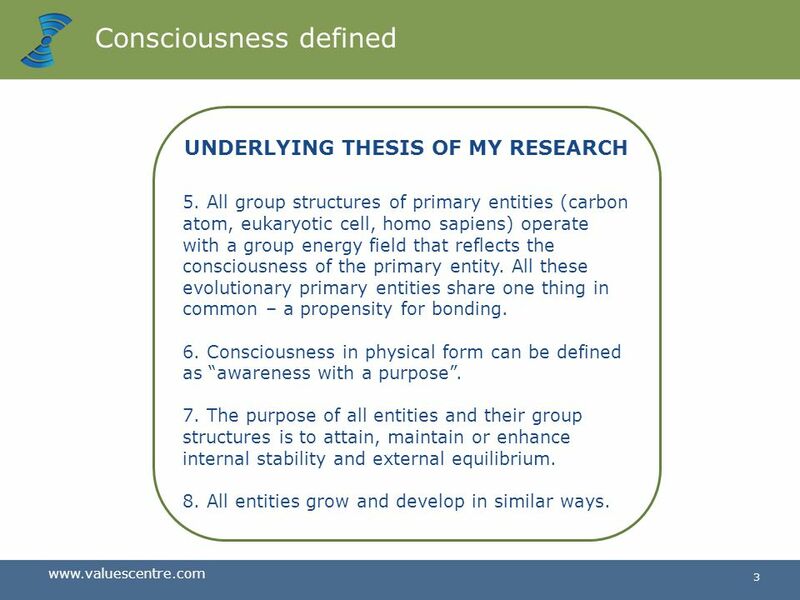 All group structures of primary entities (carbon atom, eukaryotic cell, homo sapiens) operate with a group energy field that reflects the consciousness of the primary entity. 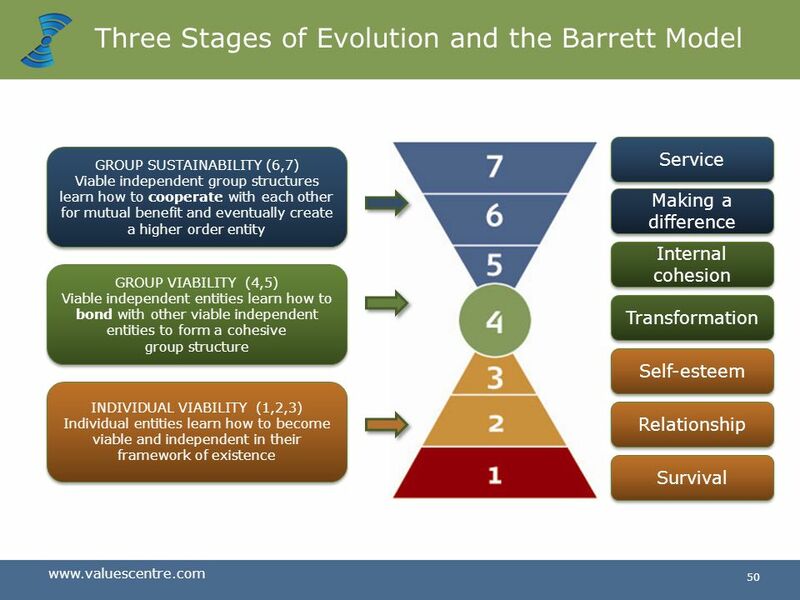 All these evolutionary primary entities share one thing in common – a propensity for bonding. 6. 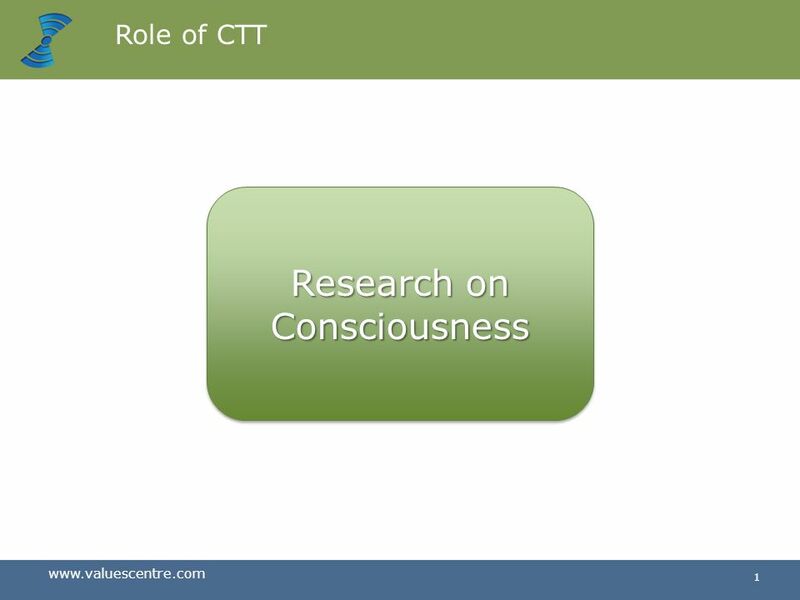 Consciousness in physical form can be defined as “awareness with a purpose”. 7. 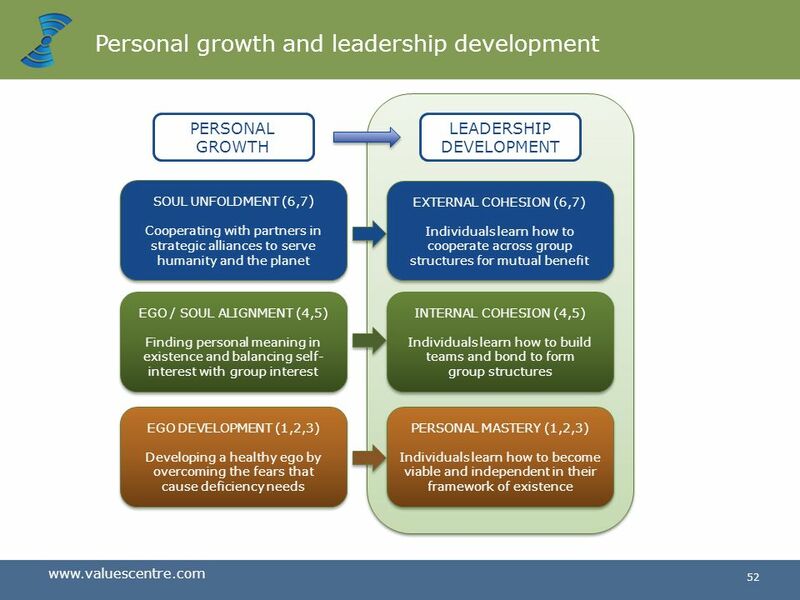 The purpose of all entities and their group structures is to attain, maintain or enhance internal stability and external equilibrium. 8. 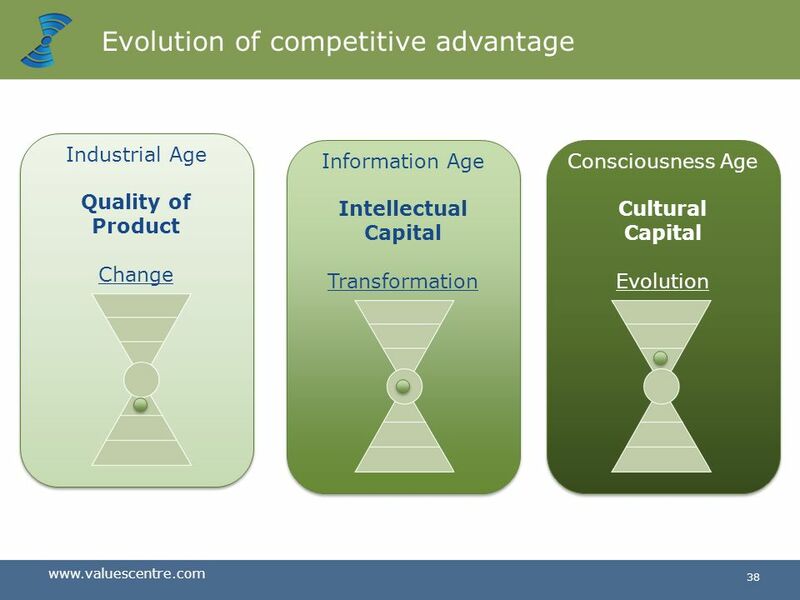 All entities grow and develop in similar ways. Corrected quote for accuracy. 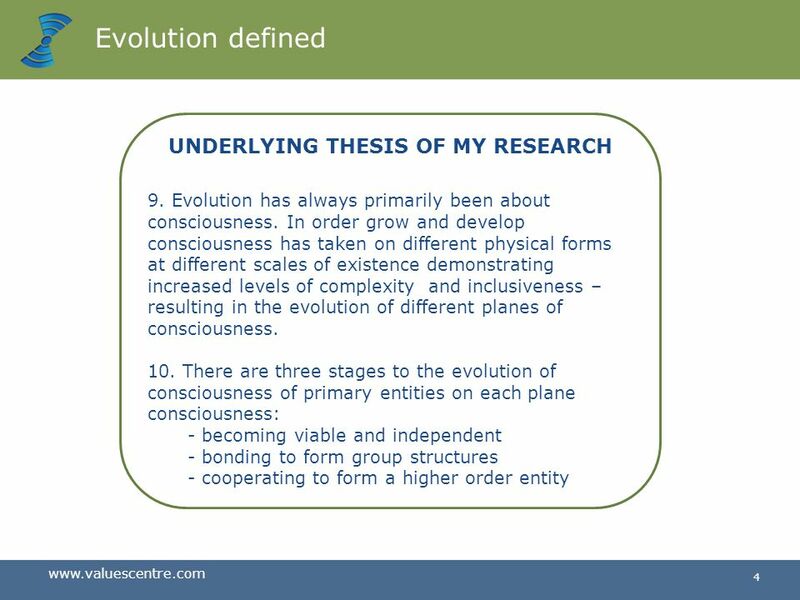 Evolution defined UNDERLYING THESIS OF MY RESEARCH 9. 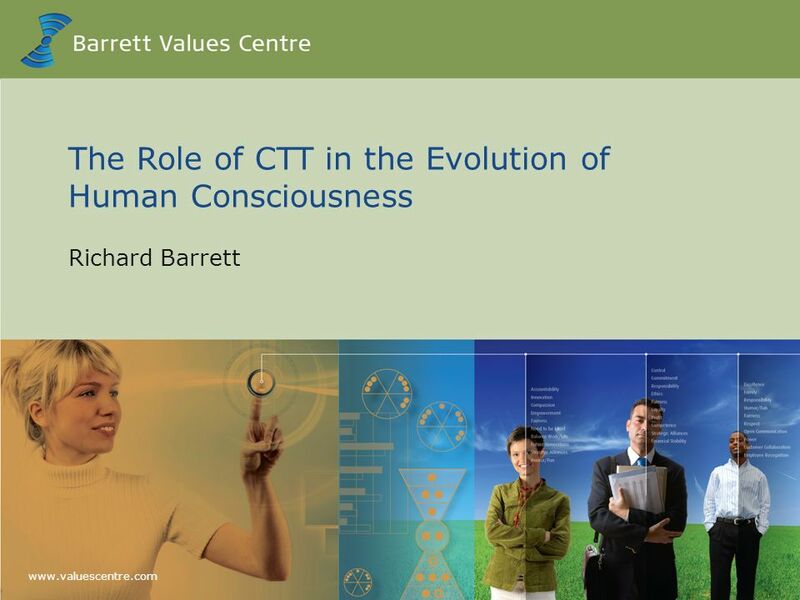 Evolution has always primarily been about consciousness. 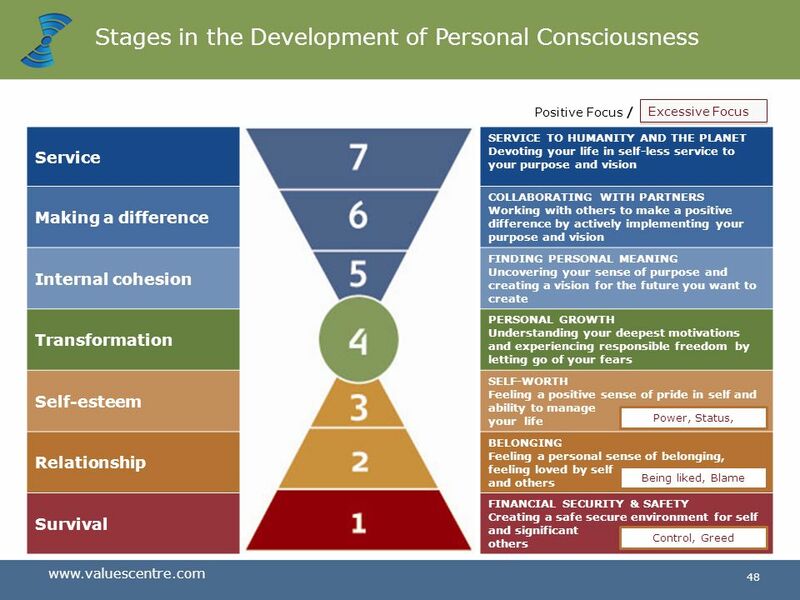 In order grow and develop consciousness has taken on different physical forms at different scales of existence demonstrating increased levels of complexity and inclusiveness – resulting in the evolution of different planes of consciousness. 10. 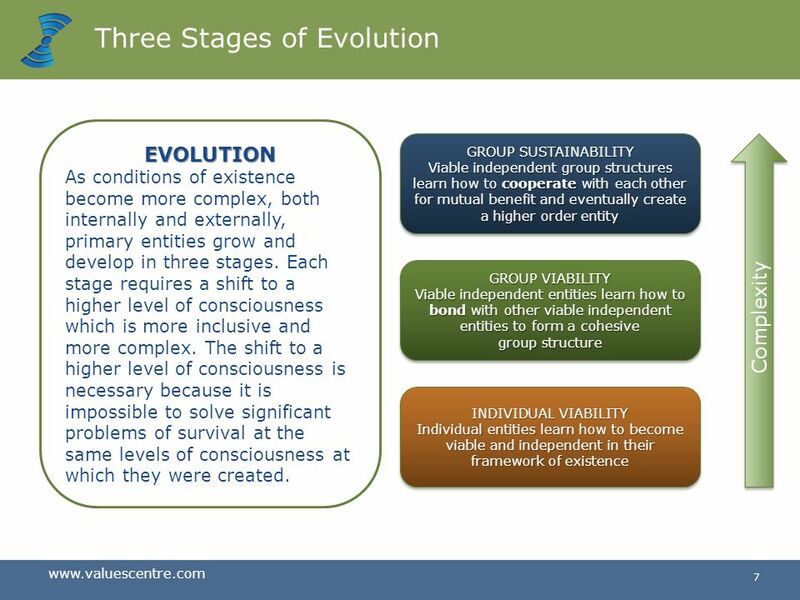 There are three stages to the evolution of consciousness of primary entities on each plane consciousness: - becoming viable and independent - bonding to form group structures - cooperating to form a higher order entity Corrected quote for accuracy. 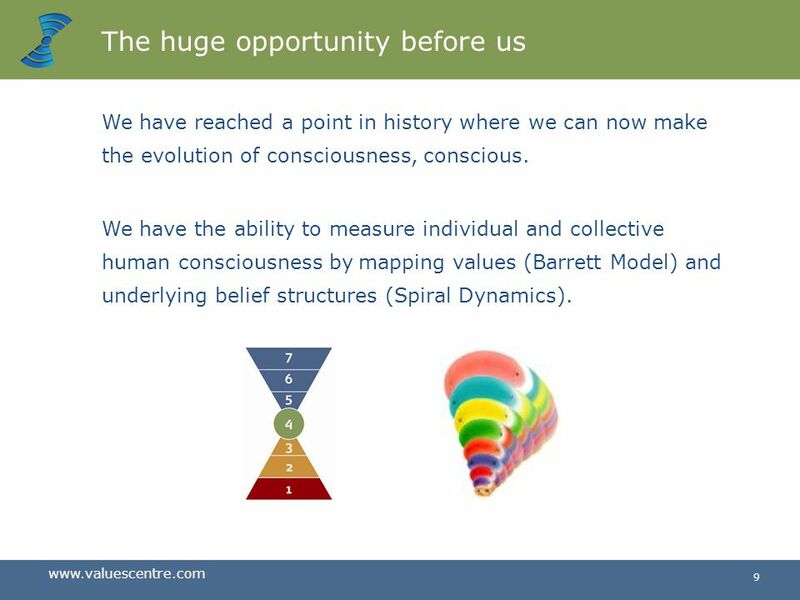 We have reached a point in history where we can now make the evolution of consciousness, conscious. We have the ability to measure individual and collective human consciousness by mapping values (Barrett Model) and underlying belief structures (Spiral Dynamics). 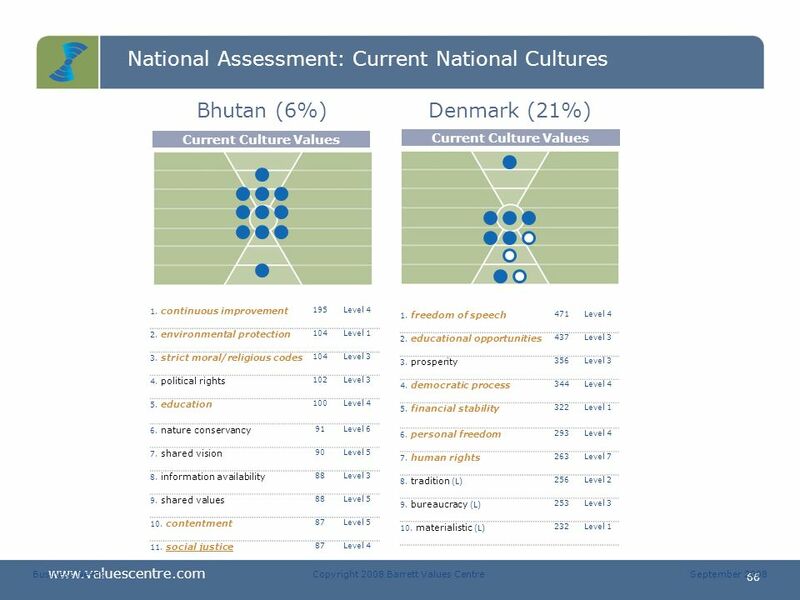 The basic issue we are collectively facing is that problems of existence are global, but the mechanisms and structures we have for solving them are primarily national. 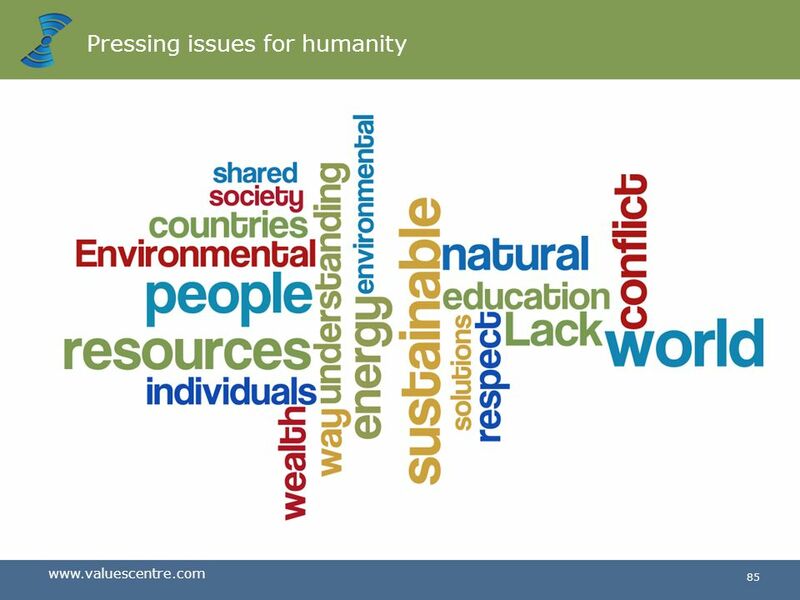 Most nations are struggling to solve issues of internal stability. We cannot solve the problems we have created in the world with the same level of thinking that we created them. 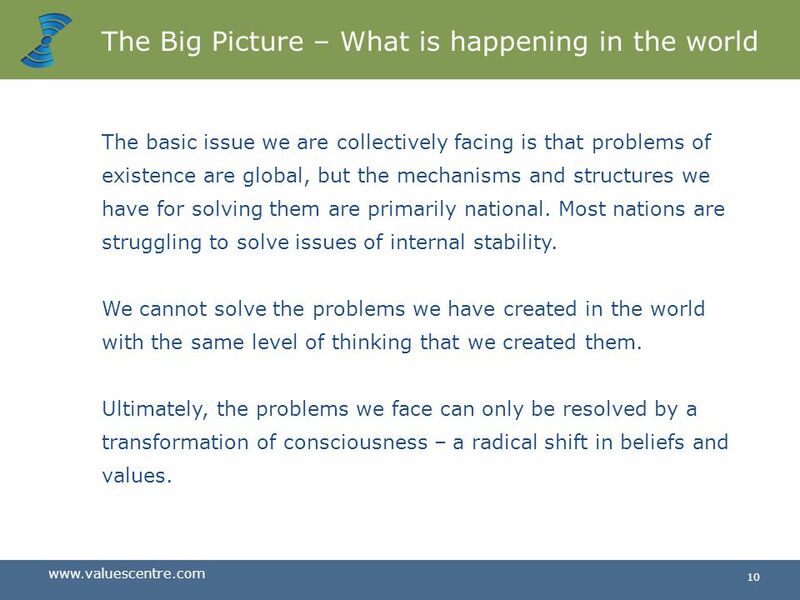 Ultimately, the problems we face can only be resolved by a transformation of consciousness – a radical shift in beliefs and values. 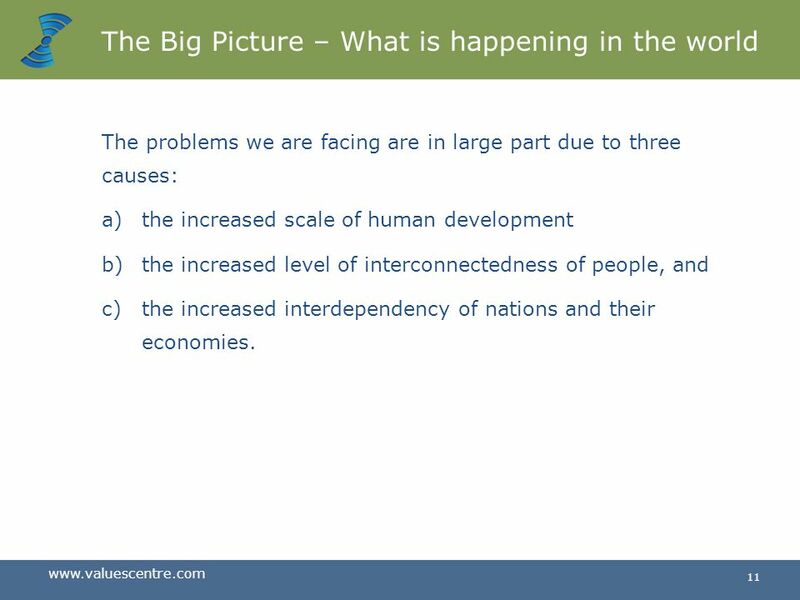 The problems we are facing are in large part due to three causes: the increased scale of human development the increased level of interconnectedness of people, and the increased interdependency of nations and their economies. 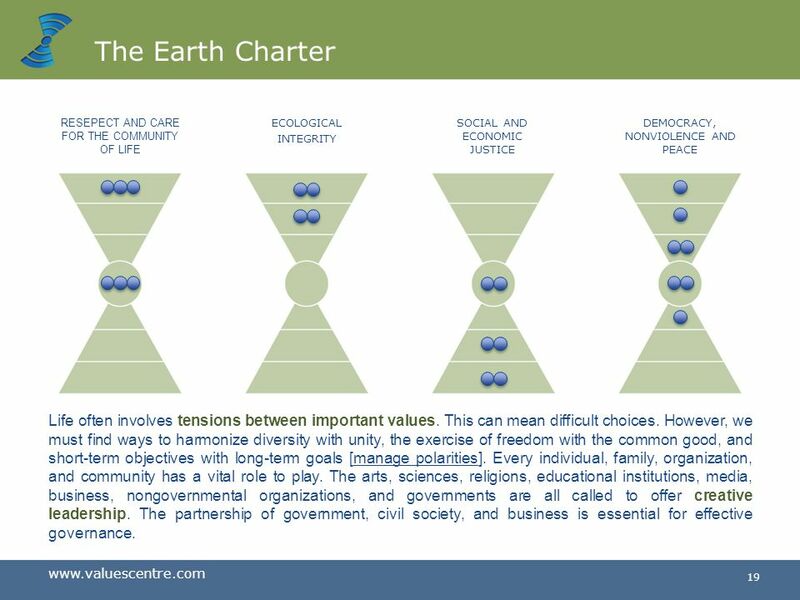 We stand at a critical moment in Earth’s history, a time when humanity must choose its future. As the world becomes increasingly interdependent and fragile, the future at once holds great peril and great promise. 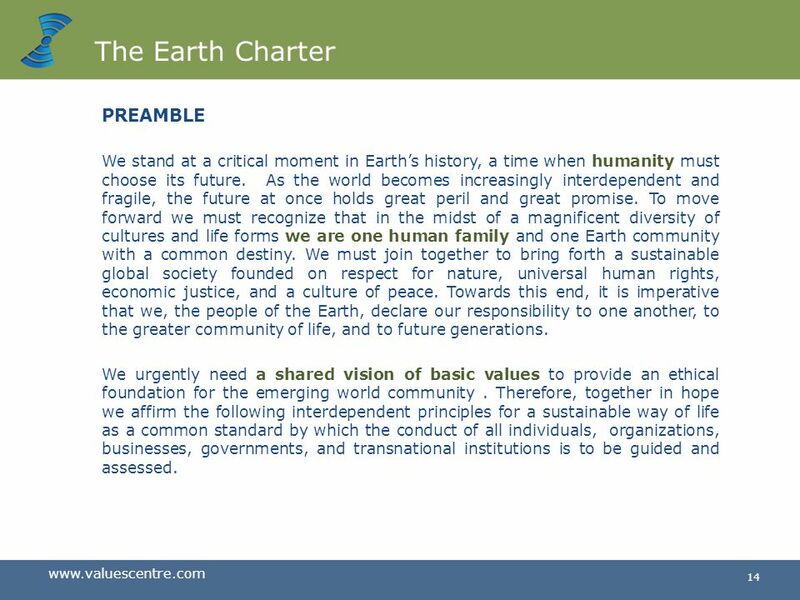 To move forward we must recognize that in the midst of a magnificent diversity of cultures and life forms we are one human family and one Earth community with a common destiny. 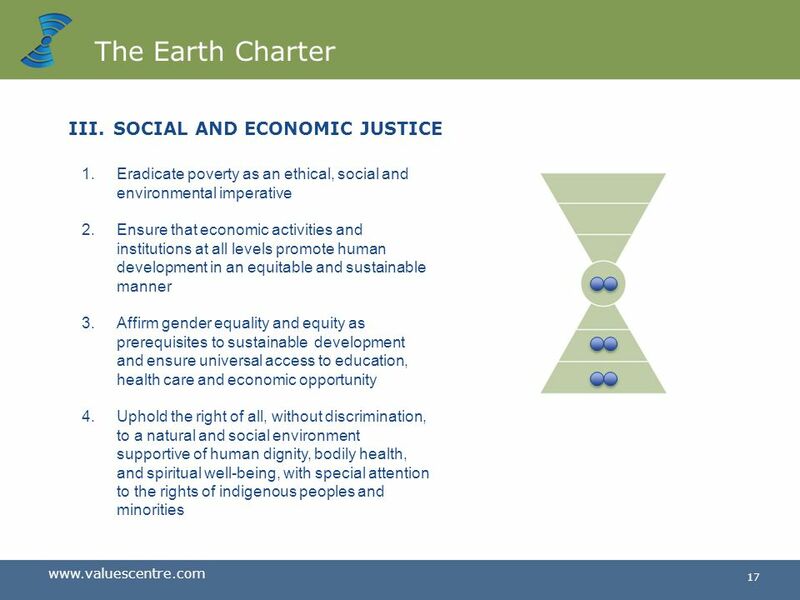 We must join together to bring forth a sustainable global society founded on respect for nature, universal human rights, economic justice, and a culture of peace. 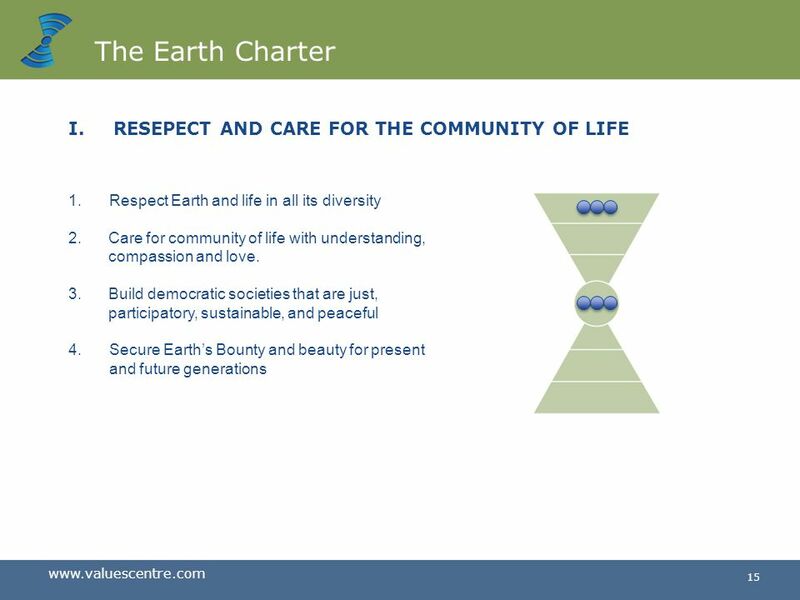 Towards this end, it is imperative that we, the people of the Earth, declare our responsibility to one another, to the greater community of life, and to future generations. We urgently need a shared vision of basic values to provide an ethical foundation for the emerging world community . 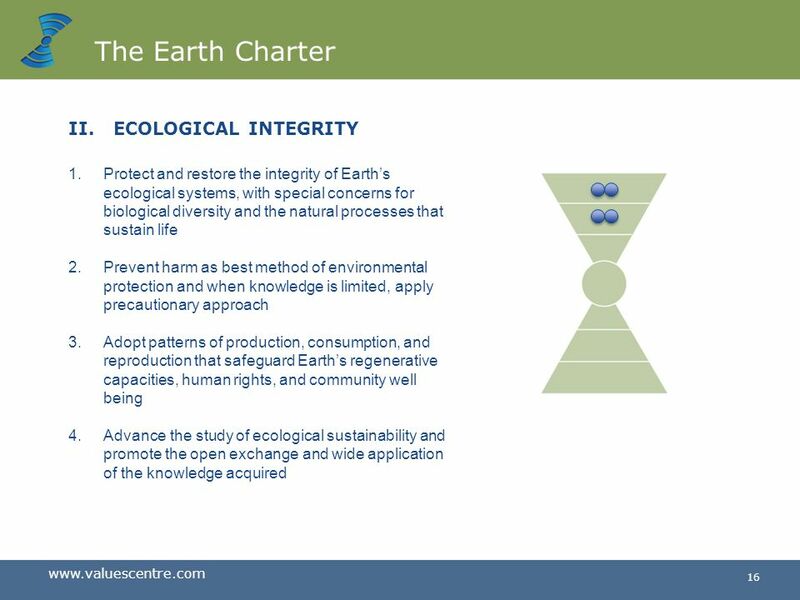 Therefore, together in hope we affirm the following interdependent principles for a sustainable way of life as a common standard by which the conduct of all individuals, organizations, businesses, governments, and transnational institutions is to be guided and assessed. 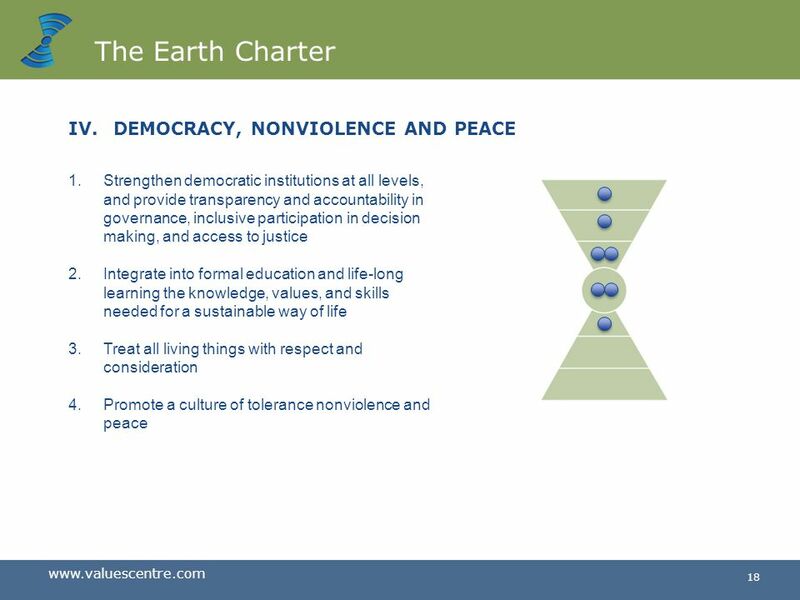 19 The Earth Charter RESEPECT AND CARE FOR THE COMMUNITY OF LIFE ECOLOGICAL INTEGRITY SOCIAL AND ECONOMIC JUSTICE DEMOCRACY, NONVIOLENCE AND PEACE Life often involves tensions between important values. This can mean difficult choices. 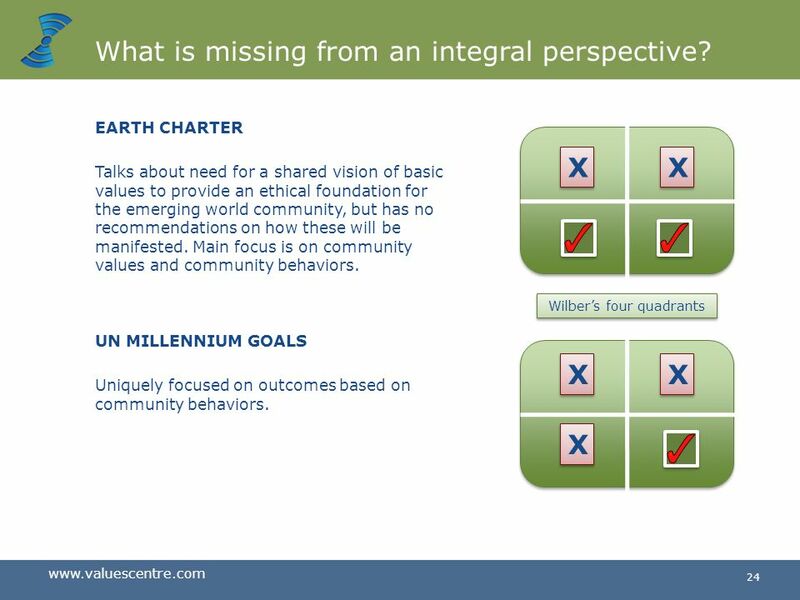 However, we must find ways to harmonize diversity with unity, the exercise of freedom with the common good, and short-term objectives with long-term goals [manage polarities]. Every individual, family, organization, and community has a vital role to play. 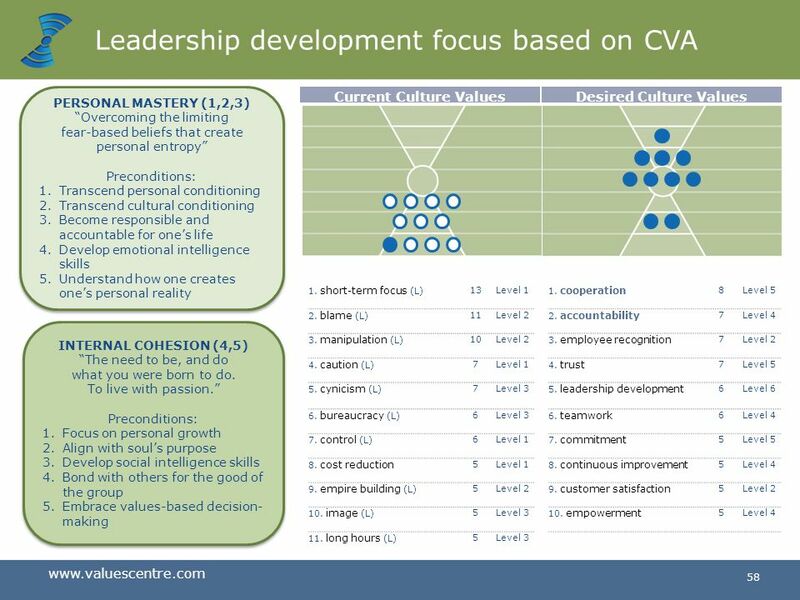 The arts, sciences, religions, educational institutions, media, business, nongovernmental organizations, and governments are all called to offer creative leadership. 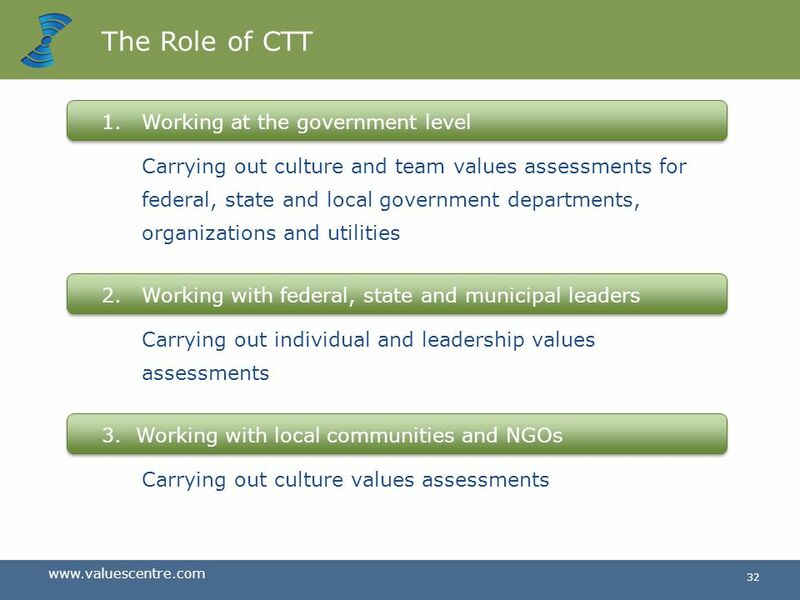 The partnership of government, civil society, and business is essential for effective governance. 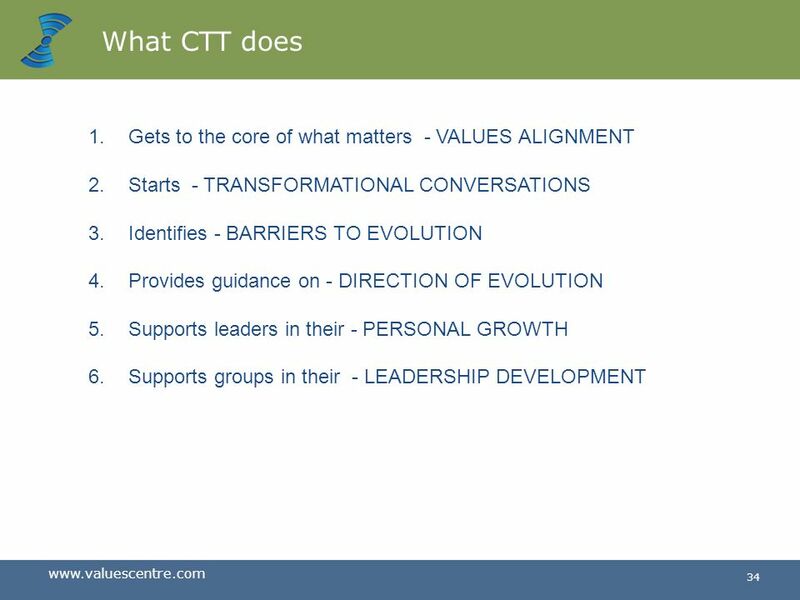 22 Role of CTT What is missing? 24 What is missing from an integral perspective? 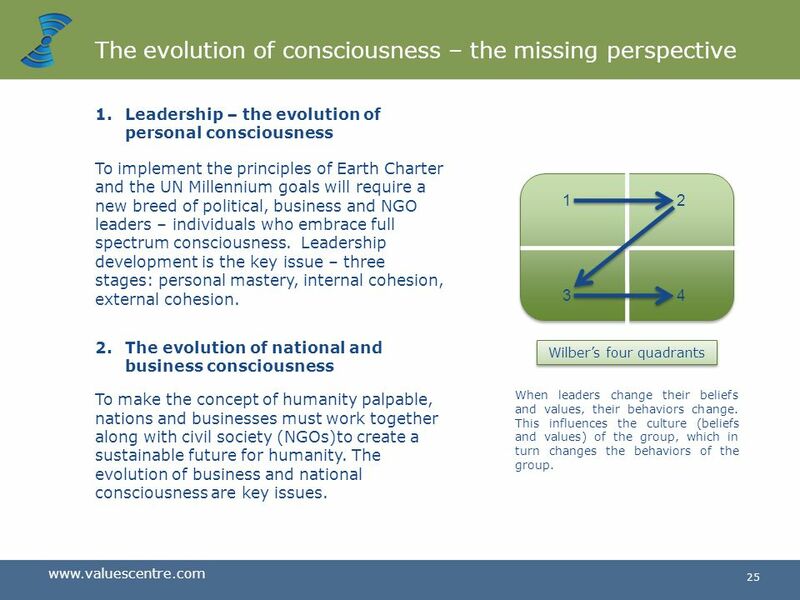 Leadership – the evolution of personal consciousness To implement the principles of Earth Charter and the UN Millennium goals will require a new breed of political, business and NGO leaders – individuals who embrace full spectrum consciousness. 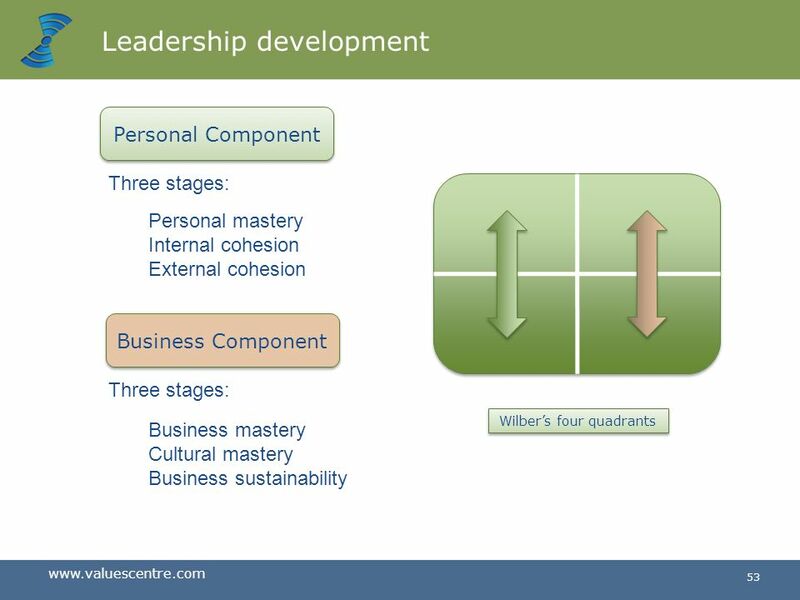 Leadership development is the key issue – three stages: personal mastery, internal cohesion, external cohesion. 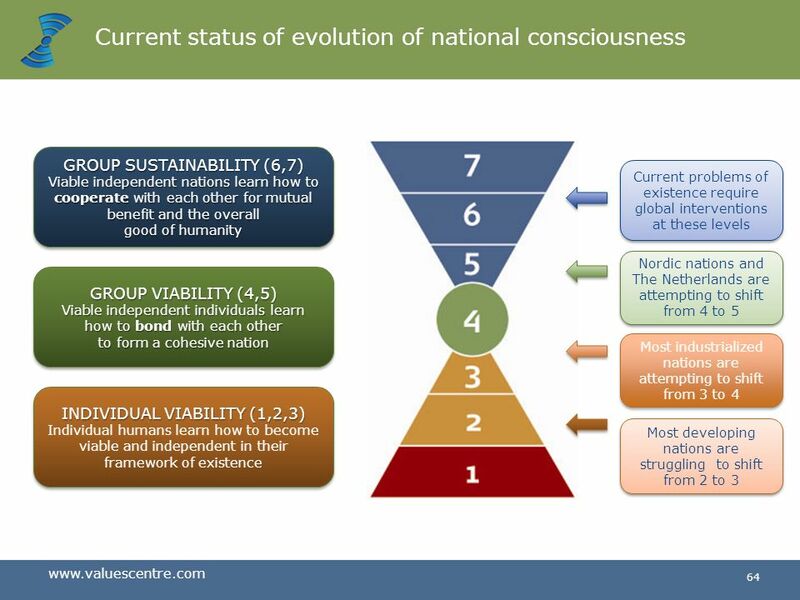 1 2 3 4 The evolution of national and business consciousness To make the concept of humanity palpable, nations and businesses must work together along with civil society (NGOs)to create a sustainable future for humanity. 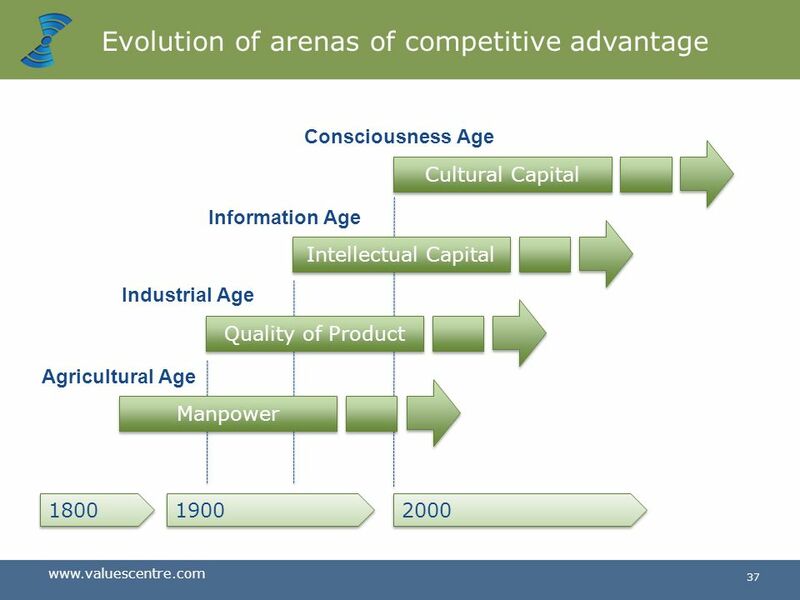 The evolution of business and national consciousness are key issues. 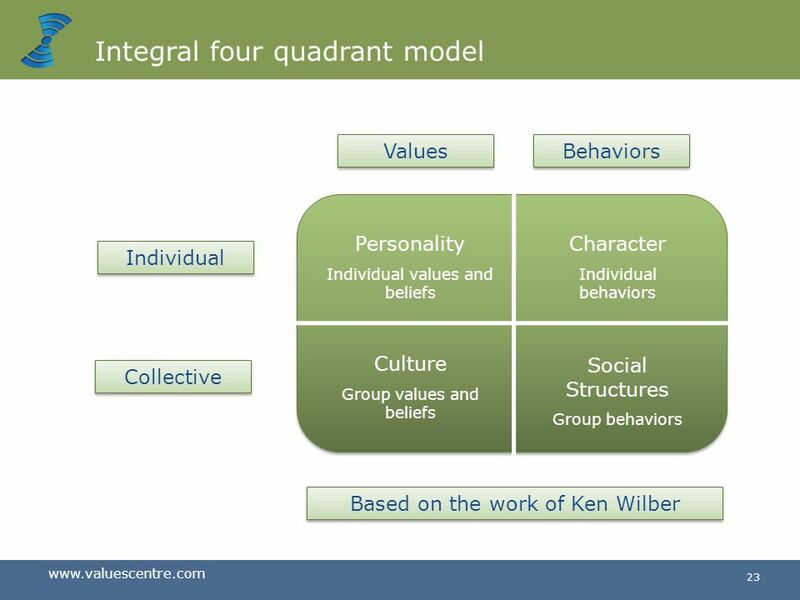 Wilber’s four quadrants When leaders change their beliefs and values, their behaviors change. 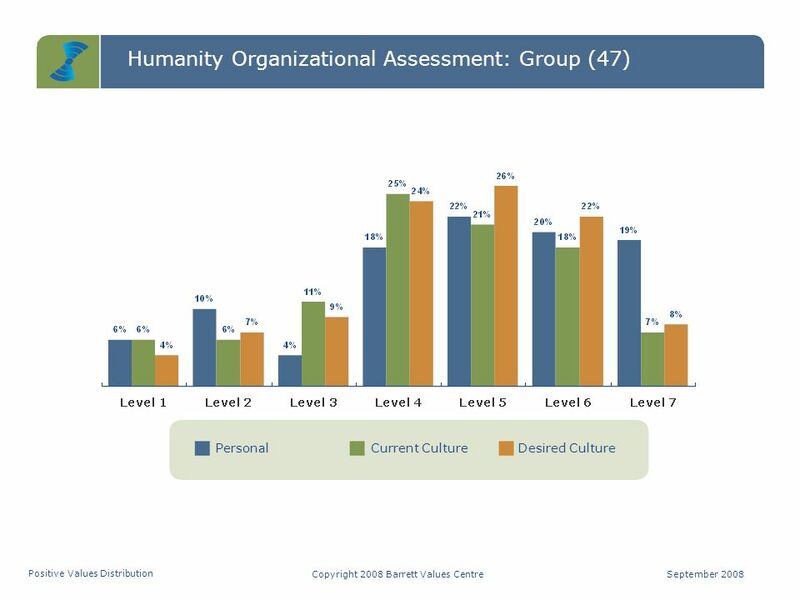 This influences the culture (beliefs and values) of the group, which in turn changes the behaviors of the group. 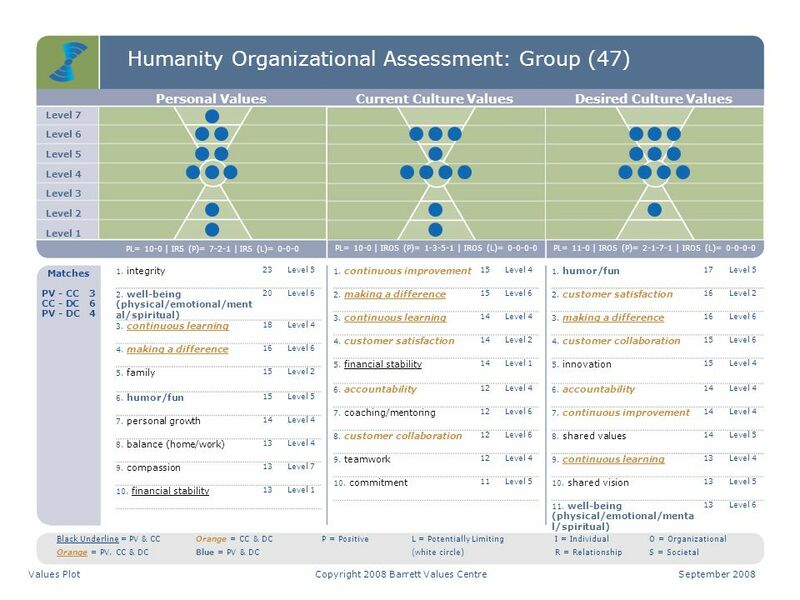 27 How do we move forward? 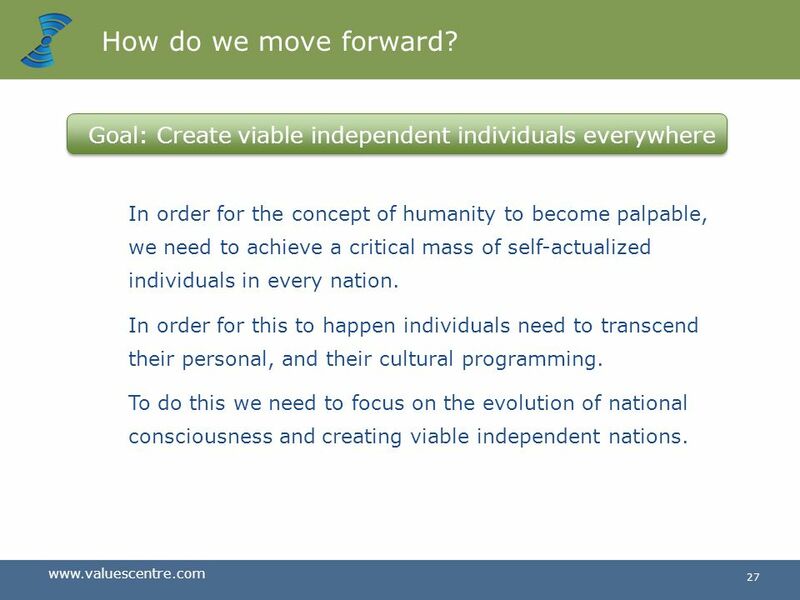 Goal: Create viable independent individuals everywhere In order for the concept of humanity to become palpable, we need to achieve a critical mass of self-actualized individuals in every nation. 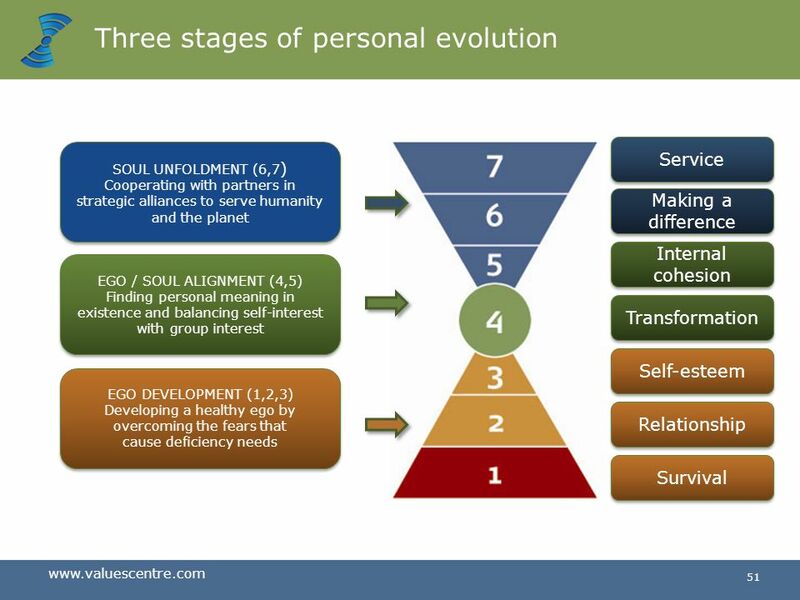 In order for this to happen individuals need to transcend their personal, and their cultural programming. 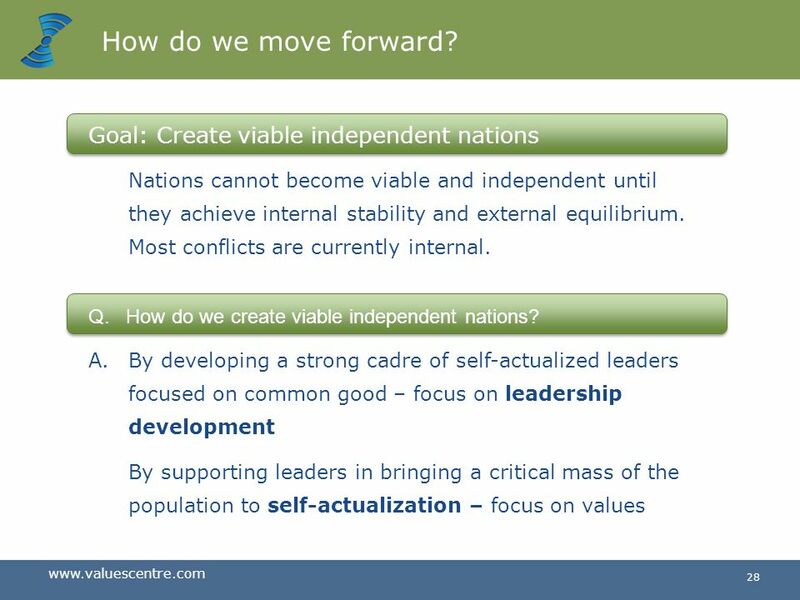 To do this we need to focus on the evolution of national consciousness and creating viable independent nations. 29 How do we move forward? Q. 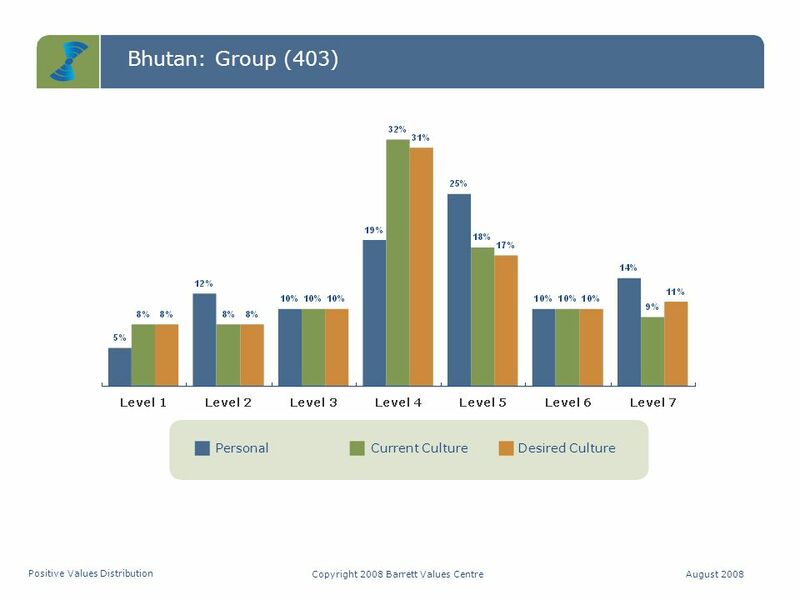 How do we bring a critical mass of population to self- actualization? A. 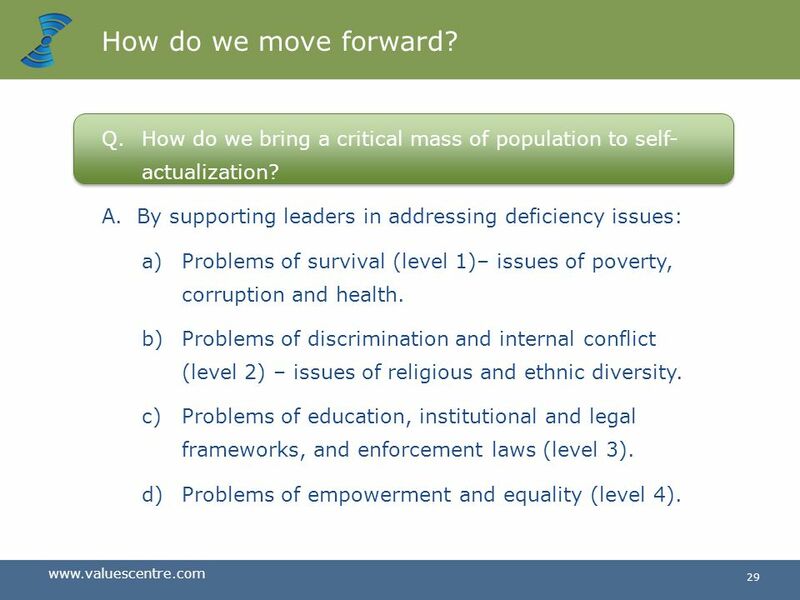 By supporting leaders in addressing deficiency issues: Problems of survival (level 1)– issues of poverty, corruption and health. 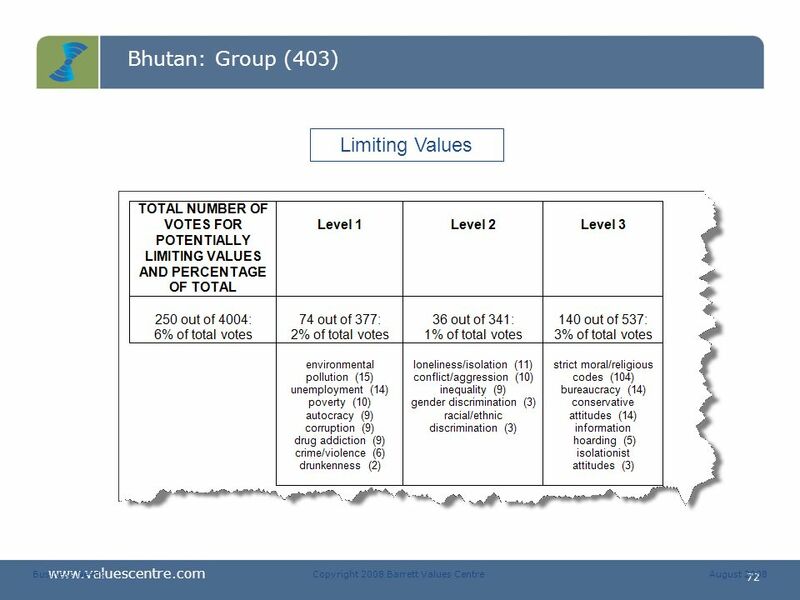 Problems of discrimination and internal conflict (level 2) – issues of religious and ethnic diversity. Problems of education, institutional and legal frameworks, and enforcement laws (level 3). 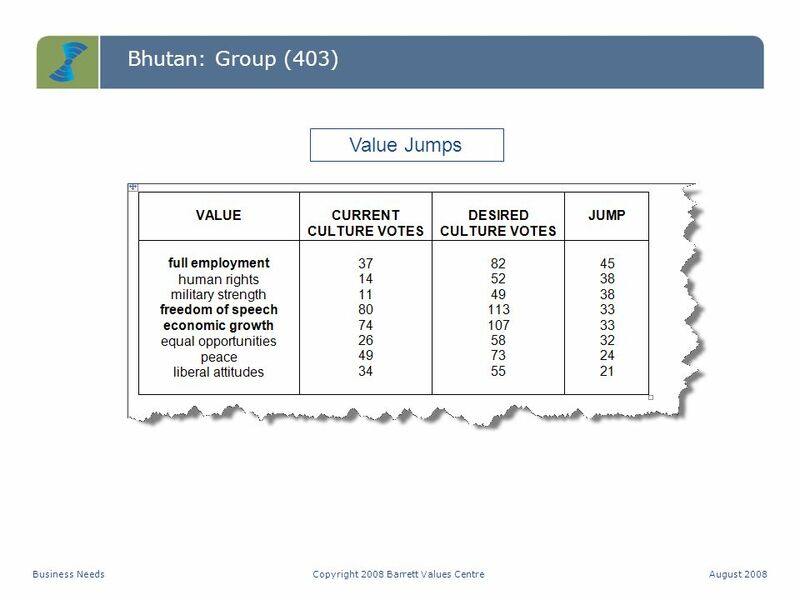 Problems of empowerment and equality (level 4). 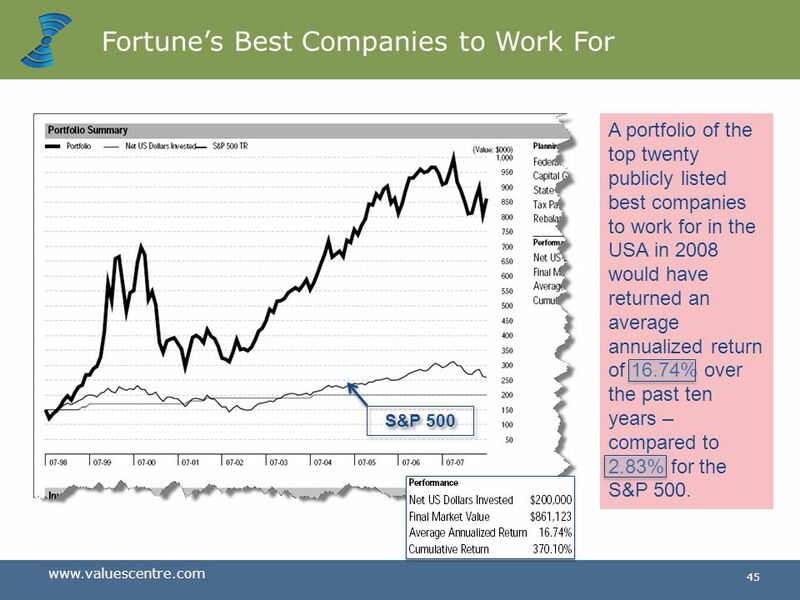 30 How do we move forward? 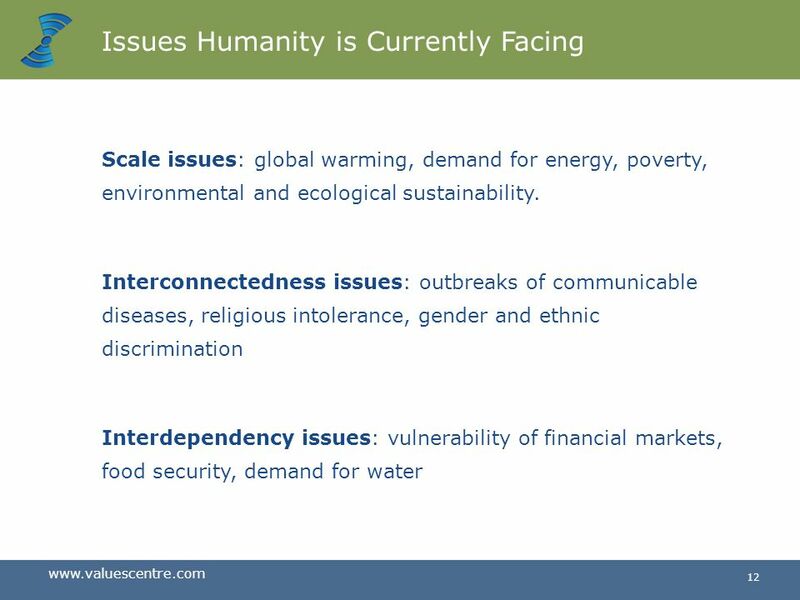 How do we address issues of poverty? A. 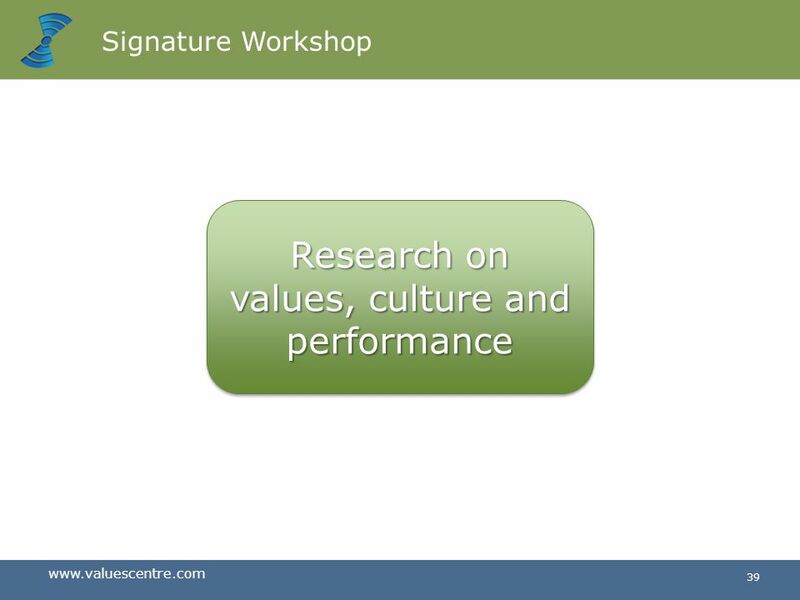 By creating an legal, financial and cultural environment * where business can flourish. 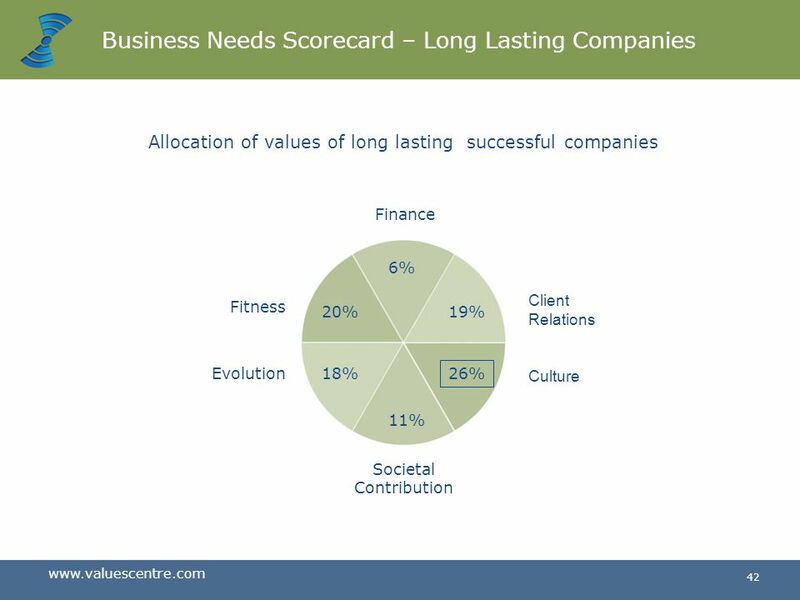 By working with business leaders and their organizational cultures to develop successful small, medium and large-scale businesses. 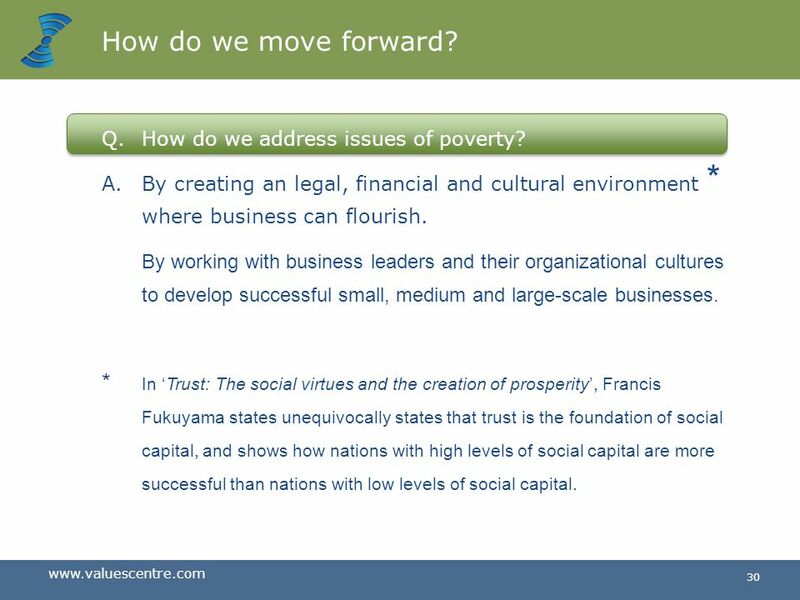 * In ‘Trust: The social virtues and the creation of prosperity’, Francis Fukuyama states unequivocally states that trust is the foundation of social capital, and shows how nations with high levels of social capital are more successful than nations with low levels of social capital. 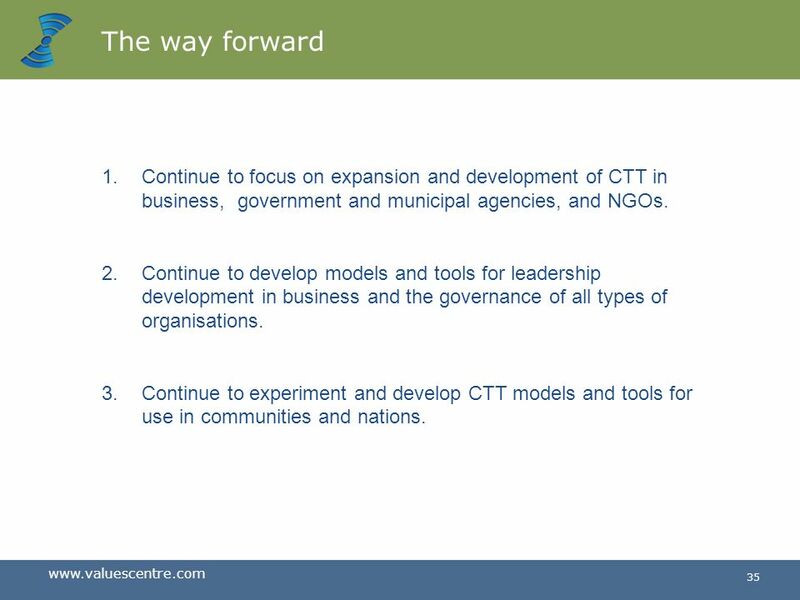 35 The way forward Continue to focus on expansion and development of CTT in business, government and municipal agencies, and NGOs. 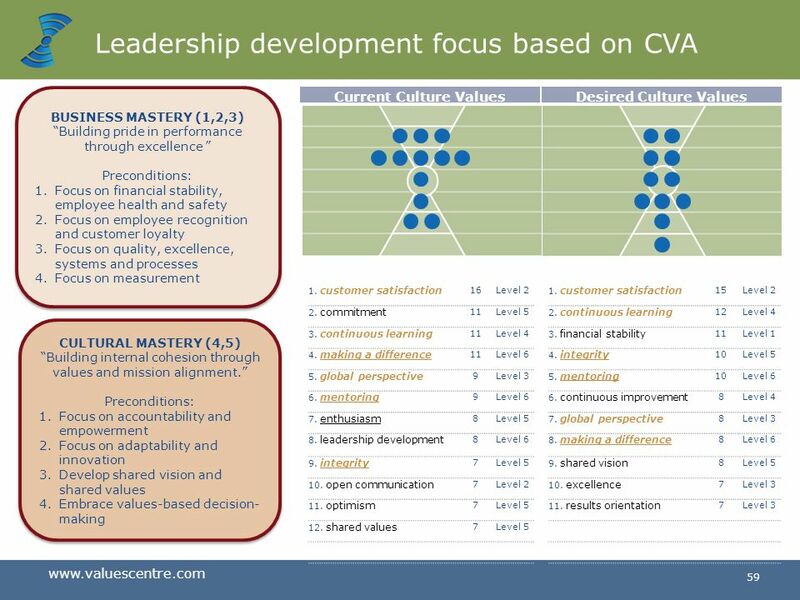 Continue to develop models and tools for leadership development in business and the governance of all types of organisations. 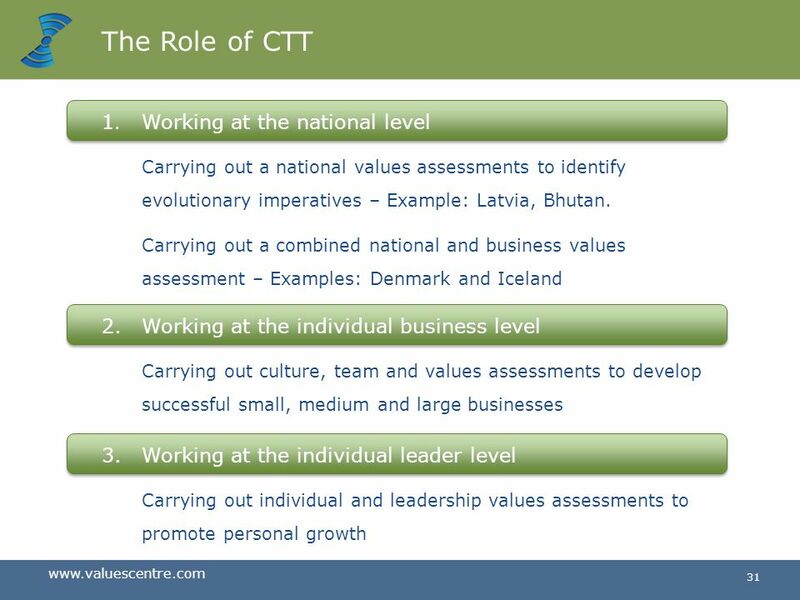 Continue to experiment and develop CTT models and tools for use in communities and nations. 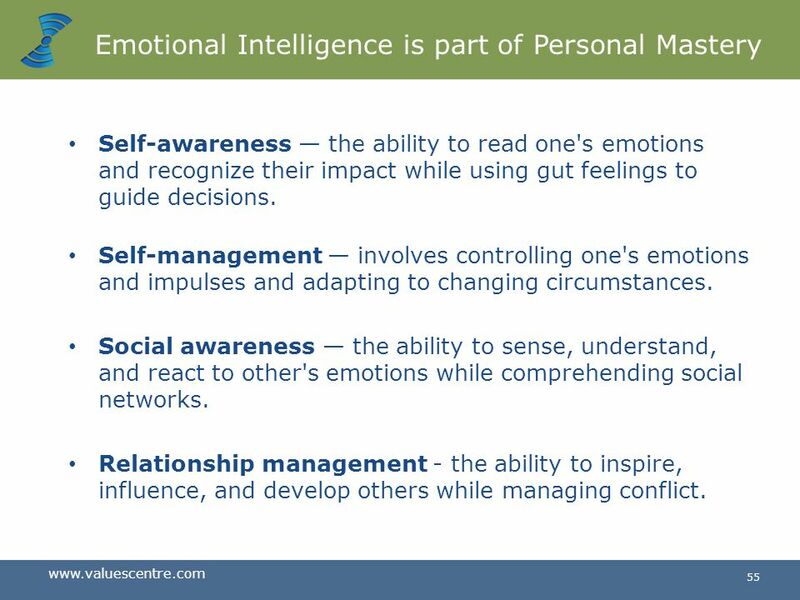 Self-awareness — the ability to read one's emotions and recognize their impact while using gut feelings to guide decisions. 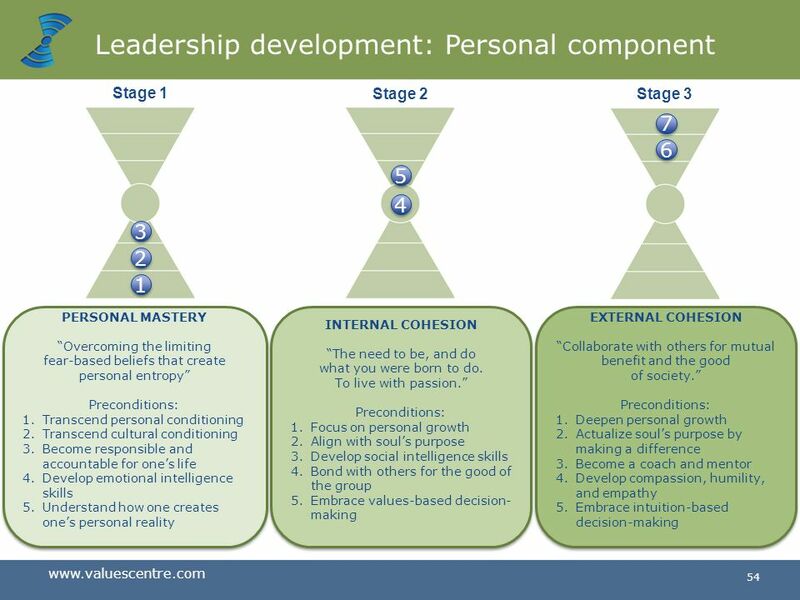 Self-management — involves controlling one's emotions and impulses and adapting to changing circumstances. Social awareness — the ability to sense, understand, and react to other's emotions while comprehending social networks. 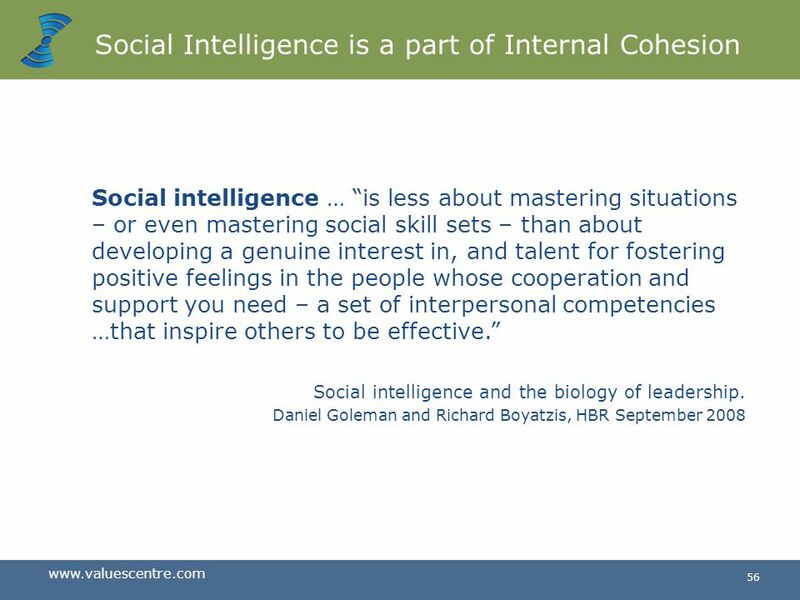 Relationship management - the ability to inspire, influence, and develop others while managing conflict. 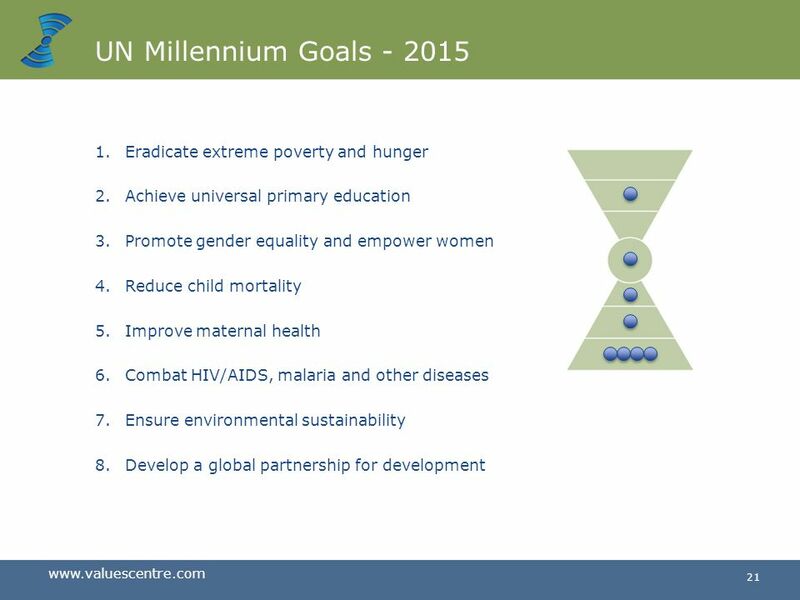 Positive Focus / Excessive Focus Global Global Sustainability Human Rights, Future Generations, Ecological Resilience. External Cohesion Strategic Alliances Regional Collaboration, Environmental Awareness, Quality of Life . 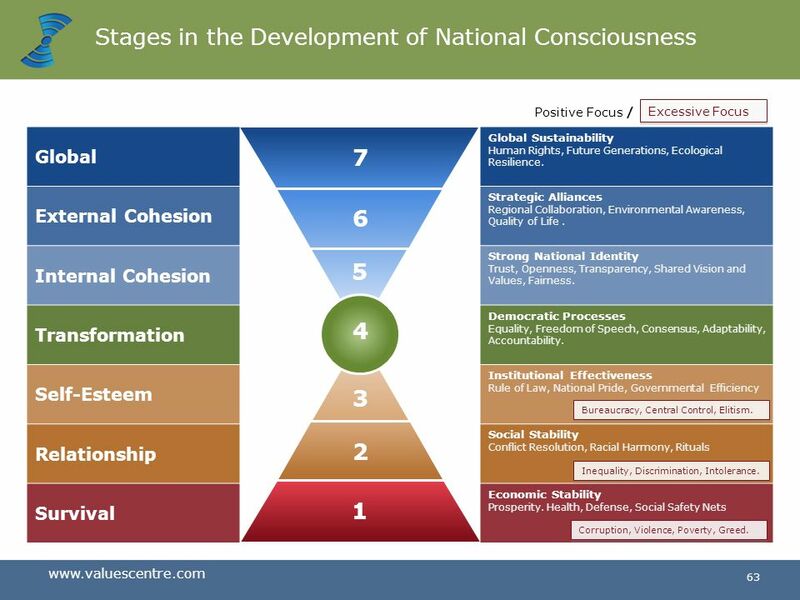 Internal Cohesion Strong National Identity Trust, Openness, Transparency, Shared Vision and Values, Fairness. 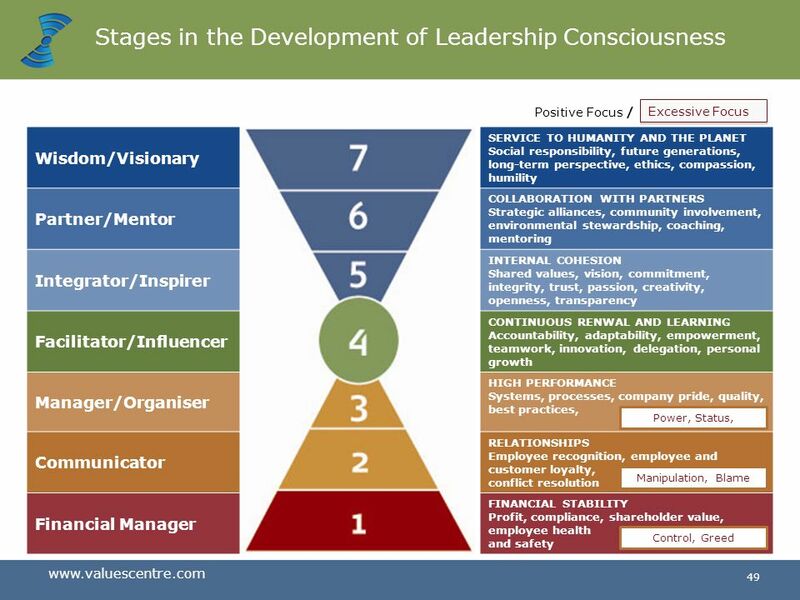 Transformation Democratic Processes Equality, Freedom of Speech, Consensus, Adaptability, Accountability. 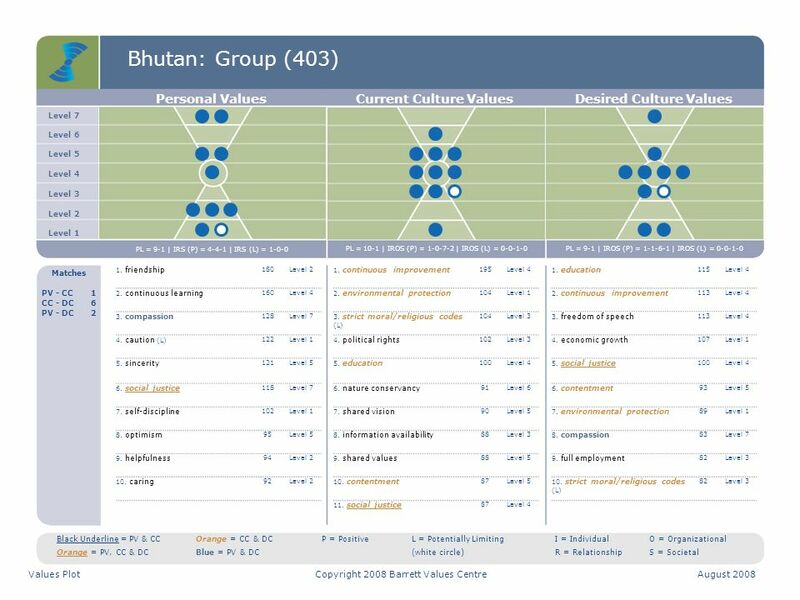 Self-Esteem Institutional Effectiveness Rule of Law, National Pride, Governmental Efficiency Relationship Social Stability Conflict Resolution, Racial Harmony, Rituals Survival Economic Stability Prosperity. Health, Defense, Social Safety Nets 7 6 5 4 Corrected quote for accuracy. 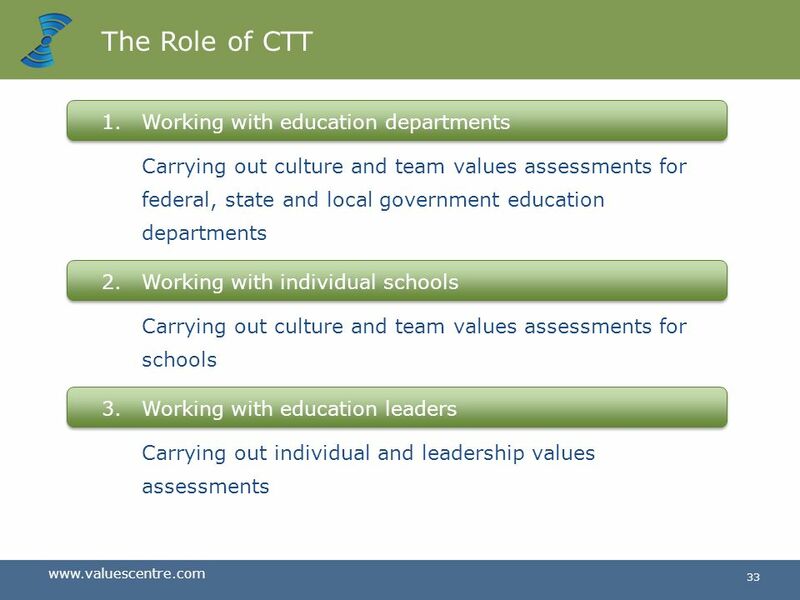 3 Bureaucracy, Central Control, Elitism. 2 Inequality, Discrimination, Intolerance. 1 Corruption, Violence, Poverty, Greed. 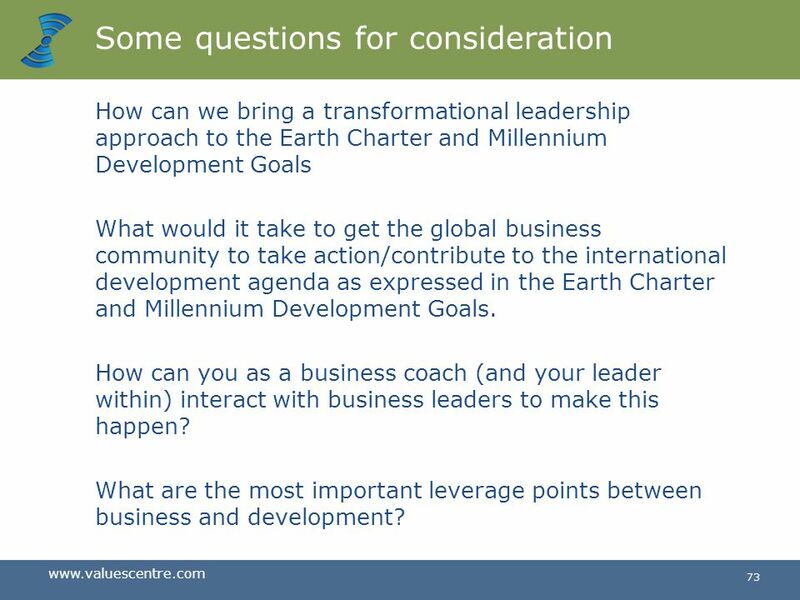 How can we bring a transformational leadership approach to the Earth Charter and Millennium Development Goals What would it take to get the global business community to take action/contribute to the international development agenda as expressed in the Earth Charter and Millennium Development Goals. How can you as a business coach (and your leader within) interact with business leaders to make this happen? 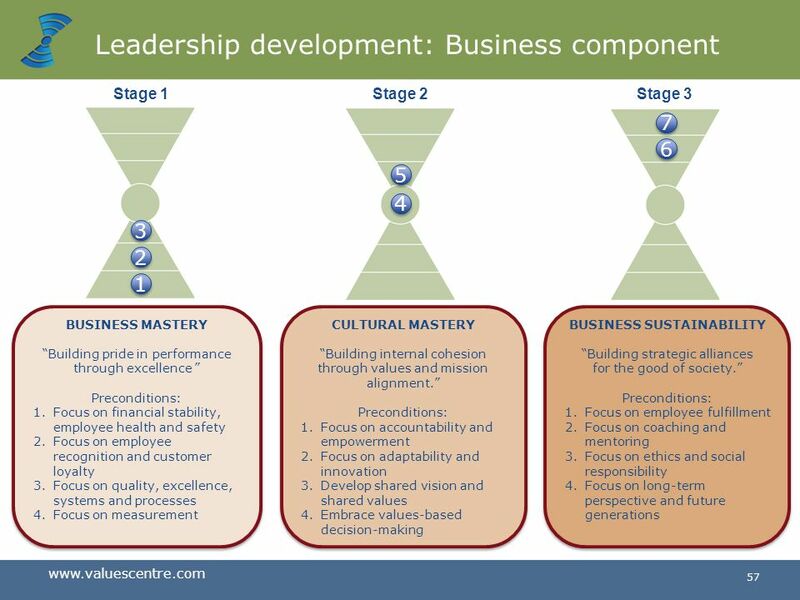 What are the most important leverage points between business and development? 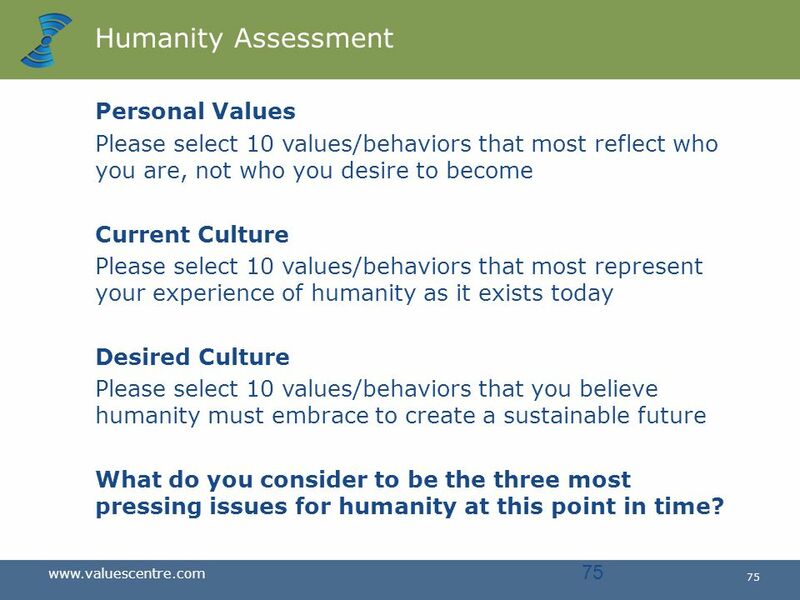 Please select 10 values/behaviors that most reflect who you are, not who you desire to become Current Culture Please select 10 values/behaviors that most represent your experience of humanity as it exists today Desired Culture Please select 10 values/behaviors that you believe humanity must embrace to create a sustainable future What do you consider to be the three most pressing issues for humanity at this point in time? 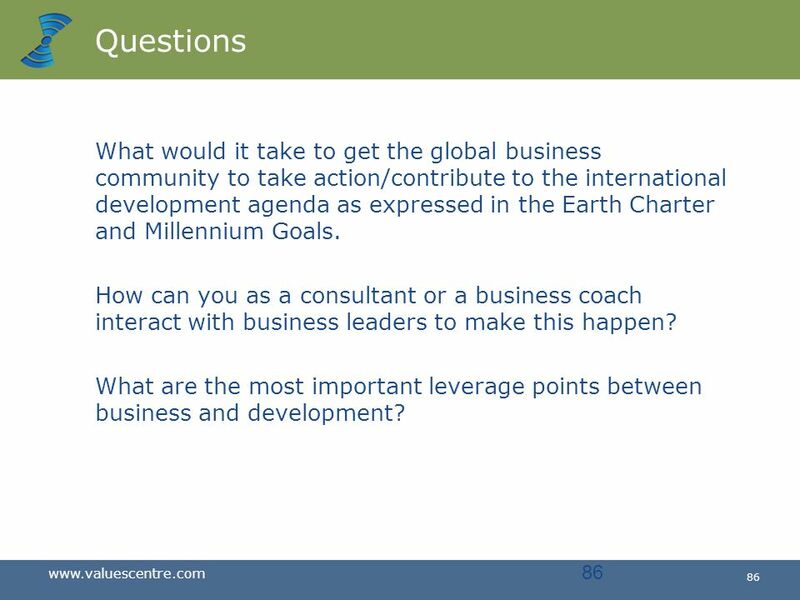 86 Questions What would it take to get the global business community to take action/contribute to the international development agenda as expressed in the Earth Charter and Millennium Goals. 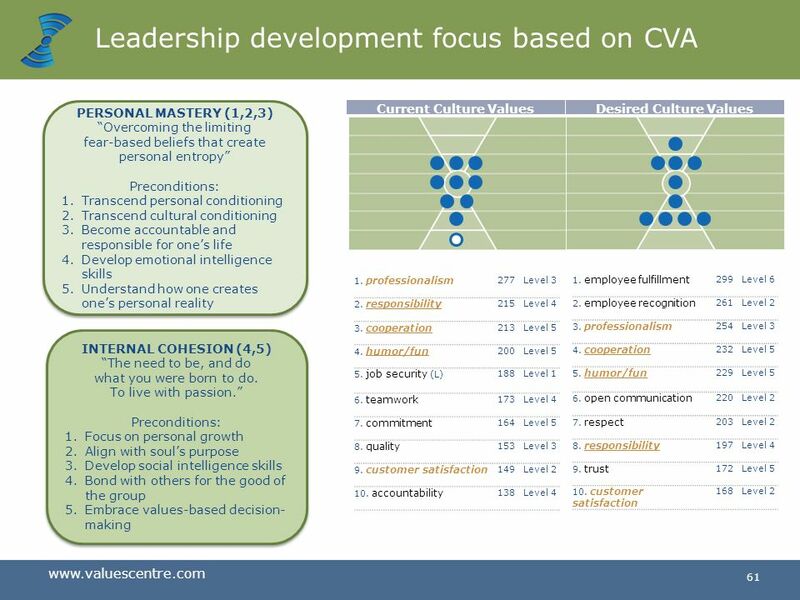 How can you as a consultant or a business coach interact with business leaders to make this happen? 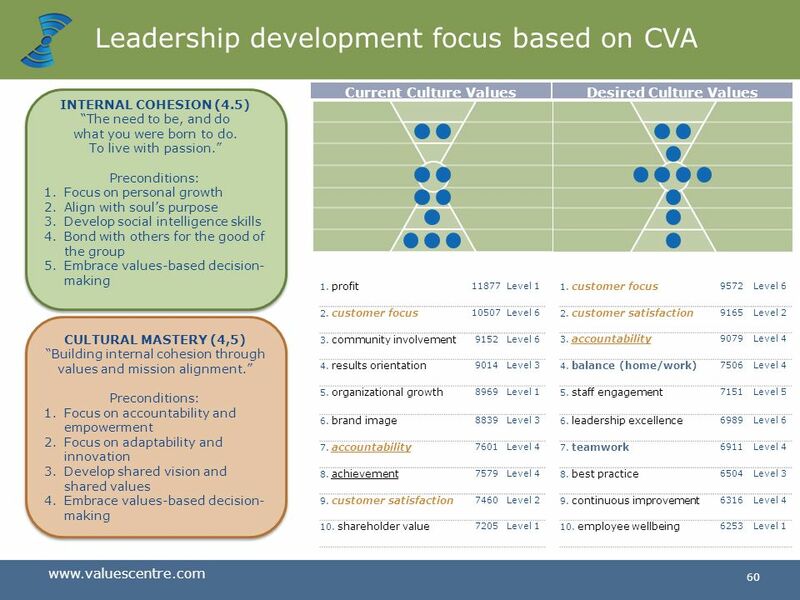 What are the most important leverage points between business and development? 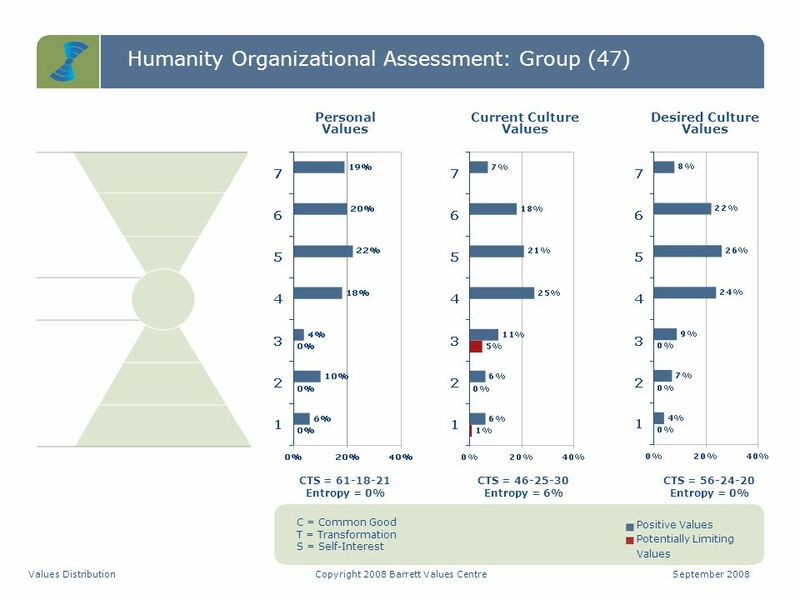 Download ppt "Research on Consciousness"
CIDAs Aid Effectiveness Agenda October Canadian aid program CIDA is the lead agency for development assistance The International Assistance Envelope.